Reading Fire + Ice Fest! — the show will go on! Neither rain, nor snow, nor rising temperatures will keep Reading Fire + Ice Fest from coming to downtown Reading this weekend! We’re well aware that compared to last weekend’s Arctic blast, the forecast for this Friday and Saturday sounds more like Spring weather. But fear not! We are prepared to present another great festival! If rain and warmer temperatures move in as predicted, we will have the ice sculptures covered to help preserve them from the elements. And unless we end up with downpours, our fire performers will light up the night with their shows. Festivities will kick off at 5:30 in the 500 block of Penn Street and continue all day Saturday. Click here for the schedule of events for both days. 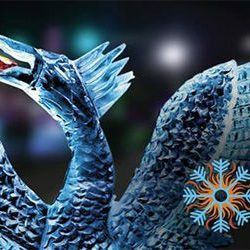 Produced and organized by the Reading Downtown Improvement District, Reading Fire + Ice Fest returns for the fourth consecutive year with professional ice-carving competitions, fire performances, a Snowfall Ball, a pancake breakfast, a chili cook-off, an ice wine bar, live music, food trucks, and more! All outdoor activities will again be free, and the Ball, breakfast and cook-off will have nominal entry fees. Go Go Gadjet will bring its electrifying show to the Snowfall Ball on Saturday night at the DoubleTree by Hilton hotel in the 700 block of Penn Street. Tickets will only be available at the door and are $10 per person and $5 for students with ID; children under 5 are free. Doors open at 6 and the band takes the stage at 7. Food and drinks will be available for purchase. The chili cook-off, which is being sponsored by the Greater Reading Chamber Alliance, will be held Saturday from 11 a.m. to 2 p.m. at the ballroom in The Abraham Lincoln, Fifth and Washington Streets. There will be two categories that contestants will be judged in — People’s Choice and Judges Choice. Cash prizes and trophies will be awarded to the top three in each category. For just $5, you can get into the cook-off and taste all the dishes, then vote for your favorite(s)! Genesius Theater will enthrall and entertain all who stop by the Outside In restaurant at Sixth and Penn Streets on Saturday morning to enjoy a delicious pancake breakfast. The event will be from 8 to 11 a.m. and will cost $8 per person. Of course, the show can’t go on without the fabulous ice sculptures and carving demonstrations presented by Sculpted Ice Works near Scranton. Imagine seeing yourself posing next to angel wings (for adults and children! ), a penguin on ice skates, and an oversized Pagoda, snowflake, and Liberty Bell — all made out of chilly ice?! These are just some of the sculptures that will be perfect for “selfies.” You’ll have to stop by to see what else we have in store for you! Fire performances will light up the skies both nights, featuring Madeleine Belle from Philadelphia and Burning Hearts Fire & Light Theater from Allentown. And if the weather cooperates, Madeleine may even throw on a pair of stilts and strut around the block on Saturday afternoon in her Snow Queen costume! On both days we’ll have a large food and beverage tent set up and surrounded by food trucks featuring several tasty items for sale. Be sure to check out the warm glass-blowing demonstrations presented by GoggleWorks Center for the Arts on Saturday from 2 to 5 p.m. You can also catch a shuttle, compliments of the DoubleTree, to the GoggleWorks for raku demonstrations and glass-blowing workshops. And in conjunction with the fest will be another crowd-pleaser — World Championship Ice Racing at Santander Arena on Saturday night at 7:30. The 2018 Next Generation Fire On Ice Tour will feature the biggest names in professional motorcycle ice racing. Reading Fire + Ice Fest is made possible by a generous grant from the Hawley and Myrtle Quier Fund of Berks County Community Foundation. Don’t let a little iffy weather keep you from the greatest time you’ll have all winter. Come out and enjoy Reading Fire + Ice Fest!